You have to hand it to CNN for flagging this story of ill-gotten Gain on Saturday. 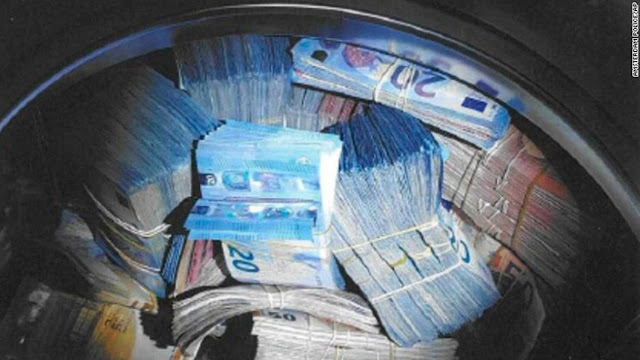 Authorities in Amsterdam, Netherlands were conducting clean searches in the city this week when they came across €350,000 ($400,000 US) crammed into a washing machine. So what did they do with the man found on the premises? Arrested him on suspicion of money-laundering, of course. In a statement to CNN, police said that no one was registered a resident at the home. It was supposed to be vacant. It was in that home they found the machine full of cash. But that wasn’t All. They also found a gun, a money-counting machine, some mobile phones, and box of Tide pods. Okay, not the Tide pods, but the rest is really from the report. It was a full load of evidence. “I’ve heard of coin-operated laundry machines, but this is ridiculous,” said no one in the story to this writer’s disappointment. The police have not yet released the suspect’s name, but probably will after they separate the evidence and the darks from the brights. Then he’ll likely be Wisk-ed away to jail before he can Bounce. Signs of crime can really stain a city, but these cops are dedicated to cleaning up the streets.